Who knew baby elephants could be so cute! The baby elephant glass personalized Christmas ornament also manages to be very detailed and accurate in its shaping and proportions, giving it a realism that makes it even more appealing to many. We feature quite a few animal ornaments personalized by this artist, and the delicate use of glitter is a highlight of each. 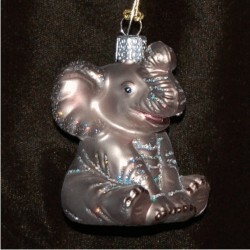 We'll add your custom information to the baby elephant blown glass Christmas ornament before nestling it in our exclusive black velvet gift bag.